From the first call until after the event the service was professional, friendly and outstanding! I will definitely be using the Oyster King again and recommend them to our clients. We were all delighted with the Oyster King service and Thomas‘ participation. Thank you all for fresh and delicious oysters and a wonderful king! Thank you so very much! Our Oyster King Ashley took my birthday party at the Westcliff to the next level! He was professional, informative and oh so charming and obliging to both the ladies and the few kids who were there. Our guests repeatedly asked for your contact details and were gob smacked by the great touch you added. Origin Travel arranged the ”Mother of all Parties” to celebrate the 10th Birthday party of Origin Wine at the Grand Café & Beach for 300 people. Oyster King was fantastic! Thanks to their perfect organization and professionalism they made everything seem so effortless, but those of us in the know, know exactly how much hard work is involved. The Macaron Queens added a charming touch and of course those Macarons were to die for. There is no better combination than a freshly shucked Oyster and a glass of French Champagne, served by the sophisticated Bubbly Queen and her charming Oyster King on a Sunday afternoon. Thank you for your great work at the MTN Prestige Marquee at the BMW Polo series; we truly value the extra experience that your team from the Oyster King added to this occasion, and we look forward to many events together in the future. The Oyster King and Bubbly Queens were professional and added value to our event. Good interaction between the Oyster Kings and guests as fresh oysters were served to suit each guest’s taste and preference. Great way to spice up an event. Great ice-breaker and creating a relaxed atmosphere giving the guests a talking point and thereby encouraging networking. We would recommend this for any event. After a very successful wedding at Summerplace on 6 August 2011 both Christina and I would like to thank you for having played a part in making this lavish celebration such a huge success. We truly valued the extra something special that your team from Oyster King added to the pre-drinks session. Many guests complimented your team’s professionalism and unique concept. Just a short note of thanks to you for the outstanding participation you supplied with the “Oyster Kings”. The level of professionalism of your team is superb, and it really made the event come alive. We will definitely use you again in the future. Good luck and best regards. I just want to thank you for your assistance with the wedding on Saturday 5 November 2011. Grant was amazing and presentable and liked by one and all. The Oyster King definitely added that extra ‘zing’ to the wedding. Also, please thank Grant for being on time and for being so passionate about his work. I look forward to working with you again in the near future. 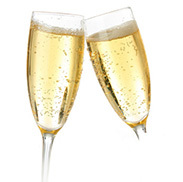 The pressure inside a Champagne bottle is around three times that of a car tyre.